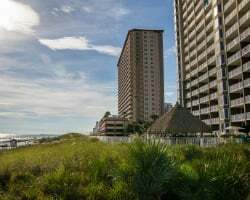 You can enjoy an annual sun-filled retreat to Panama City Beach for way less than you'd think with a timeshare resale or rental from SellMyTimeshareNow.com. Whether you're in the market to buy a timeshare, or are looking to book a timeshare rental as an affordable vacation option, we have a solution for you. Browse our vast inventory of Wyndham Panama City Beach timeshares to find the resale or rental unit to fit your vacationing needs. Experience Florida the way it was meant to be experienced. Golden beaches, cool ocean breezes, and great amenities—you'll find all of this and more at Wyndham Panama City Beach. With stunning views of the Gulf of Mexico, you'll enjoy outdoor swimming pools and hot tubs, organized activities program, and chances to take to the water for jet skiing and parasailing. The surrounding area boasts more than just beautiful beaches; you'll find fun things for all ages including championship golf courses, zoos, amusement parks, entertainment venues, and a great selection of dining options. Offering a variety of suite sizes, you'll have no trouble finding the perfect unit to fit the size of your travel party. Studios, one-, two-, and three-bedroom sized suites are well-appointed with delightful amenities to enhance your vacation experience and make you feel right at home. Adorned with bright and modern decor, most units offer full kitchens, plush furnishings, private balconies with views of the Gulf of Mexico, multiple bathrooms, private bedrooms, and washers and dryers. Find a great vacation in Wyndham Panama City Beach Resort today! Start by completing the form to the right, or calling us directly at 1-877-815-4227. We'll help you to find the perfect accommodations without stepping outside your budget. You can own a Wyndham Panama City Beach timeshare with all the incredible Wyndham ownership benefits for a price that won't break the bank. Rather than buying from the resort, where you will pay extra fees and large sales commissions, the resale market features by-owner inventory that is advertised at prices up to 70% off. This is because the timeshares are advertised based on their true and current market value. So this way, you are only paying for exactly what you are buying, and saving thousands of dollars in the process! Our inventory of Wyndham Panama City Beach Vacation Resort resales feature deeded points-based weeks with annual or biennial usage. You'll find that each timeshare comes with a specific allotment of points. These points can be used like currency to customize each vacation. Use them to reserve when, where and how long you travel, giving you full flexibility. When you buy a timeshare at Wyndham Panama City Beach resort, you have total flexibility regarding when and where you travel. While Wyndham Panama City Beach will be your home resort, your timeshare comes with a certain amount of allotted points that can be used to exchange into any other Wyndham resort locations. These Club Wyndham points can also be used to make a reservation for when and how long you want to vacation each time. In addition, Club Wyndham offers a slew of incredible ownership benefits that even Wyndham timeshare resale owners are able to enjoy. Notable perks include travel discounts, the ability to use your points for cruise vacations, and opportunities to go on guided excursions with the Wyndham Adventures program. Wyndham Vacation Resorts Panama City Beach is also affiliated with the world's leading external exchange company, RCI. With the purchase of an annual membership, Wyndham Panama City Beach timeshare owners can access RCI's vast network of affiliated properties located in all the most desirable destinations throughout the world. Gaining access to RCI's comprehensive exchange services is your ticket to travel the world. Making it even easier, Wyndham Panama City Beach is an RCI Silver Crown rated resort. This gives you a higher trading power within RCI's extensive network. With this rating, you have thousands and thousands of travel options at your fingertips for unique and exciting vacation experiences every time. 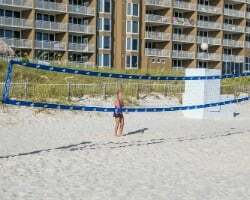 The Wyndham Panama City Beach resort has amenities to fit the needs and wants of every traveler. Enjoy activities both outside and in all while receiving exceptional service. 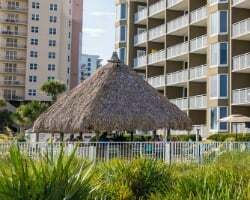 Features include direct beach access, two outdoor pools, hot tubs, a tiki bar, a coffee shop with WiFi, and water sport rentals like parasailing and jet skiing. If you're looking to venture outside of the resort grounds, you can consult the concierge or the tour desk for recommendations and assistance in booking and planning various tours and excursions. 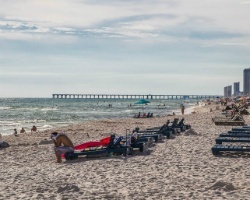 Panama City Beach offers a wide range of attractions for the young and old. Nearby the resort you'll find Zoo World, Club LaVela, Shipwreck Island Waterpark, Pier Park, Gulf World Marine Park, and so much more. Wyndham Vacation Resorts Panama City Beach is also located near a great selection of championship and mini golf courses, great nightlife, cruises along the Gulf of Mexico, and upscale shopping centers. Already Own at Wyndham Vacation Resorts Panama City Beach?